From one corner of Oregon to the other, cool mornings, warm afternoons and early fall colors make September a perfect month to explore Oregon on the water, on the trail, on the tee, or on your plate at one of Oregon Bounty’s culinary destinations. The colors are just starting to change in the Eugene, Cascades & Coast region. Golden brown grasses line Pre’s Trail in Eugene, the first leaves are falling on Cottage Grove’s Row River trail, and poison oak gives tree trunks and hillsides spots of beautiful purple-red. Leaf watchers spotted the first hints of yellow and orange along the Suislaw River while salmon fishing. In the Cascades, the huckleberries are ripe and the leaves are starting to turn red. The combination of September’s mild temperatures and scenic golf courses throughout the region make the Eugene, Cascades & Coast a great fall golf destination. 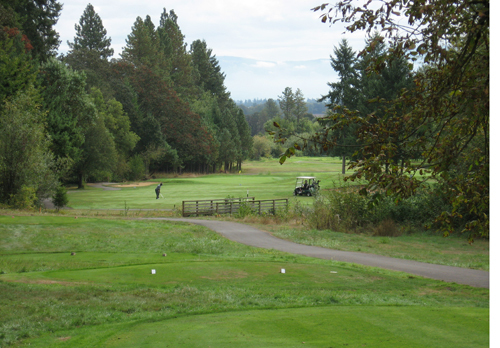 Check out Diamond Woods, nestled in Oregon Wine Country but still close to Eugene, for fabulous valley views. The color change is just starting along the coast. About 10 miles inland, trees are starting to yellow. September is the perfect time to visit the Oregon coast. With less wind, cool mornings and warmer afternoons, this is the month to watch for the occasional gray whale from Cape Perpetua’s Visitor Center deck before heading to Depoe Bay’s Salmon Bake. The colors are just starting to change in the Willamette Valley. The trees are showing a slight yellow, orange and red in the cities and towns. The best fall colors are predicted to occur in mid-October. Produce is the highlight of the week, and The Albany Visitor’s Association recommends stopping at the local farmers markets where berries, beets and carrots beckon hungry shoppers. Pack a picnic before heading to Clear Lake Resort, where you can rent a row boat and enjoy 360 degree views of early color change and crystal clear water. Save room for a piece of pie at the resort! The color change is starting to change more rapidly in the Portland area. Reds started to appear this week with more golds and yellows appearing every day. Portland is a great starting point for exploring Multnomah Falls on the Columbia River Gorge National Scenic Area and Mt. Hood. The colors are just starting to change along the Columbia River Gorge and in the upper elevations on Mt. Hood. At Multnomah Falls, most of the leaves are green with a few hints of yellow throughout. There is more yellow east of Hood River as you head toward The Dalles. Cooler temperatures in late September and early October will speed the color change. The Mosier Tunnels trail is showing color and would be a great place to do a bike ride this weekend. The Hood River Fruit Loop is a lovely stop with fall crops coming in and the Pear Celebration this weekend. The color change is barely starting in Southern Oregon. The low shrubs and groundcover at Crater Lake are just beginning to show signs of fall. Take off this weekend at Henry Estate Wings & Wine, featuring fine Oregon wine, live music, experimental aircraft and family-fun activities. The colors are just starting to change in Central Oregon. Most of the color change is in the higher elevations of the Cascades. The air is crisp and the leaves are just beginning to turn. The Bank of the Cascades Bend Fall Festival, a cozy harvest celebration, is the perfect place to celebrate the change in season. The colors are slowly starting to change throughout Eastern Oregon. The southeast corner is slowly turning yellow. The Steens Mountains will see a lot of color in October. This area is known for great birding, stunning scenery, and beautiful color. Yellowing shrubs line Summer Lake and other waterways along Highway 31, Oregon’s Outback Scenic Byway. This entry was posted in Weekly Updates and tagged Diamond Woods, festivals, golf, Oregon Bounty, Scenic Byway by Travel Lane County. Bookmark the permalink.